Companies with numerous departments, and a large number of employees benefit highly with an interdepartmental monthly attendance tracker for their employees. By having one in each department, supervisors can monitor the attendance within their department and share the data daily, weekly or monthly with human resources, and management. 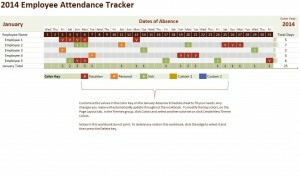 The new 2014 employee attendance tracker is a template that can be easy to customize with your own company information. It can keep track of attendance for a month. Monthly records can easily be created and edited anytime. Instead of one sheet for each employee, the 2014 employee attendance tracker can be updated with all names of employees. The template is available for download free on this page. Compatible with Microsoft Excel 2013. Download the template for the 2014 employee attendance tracker to your computer and save it in any preferred folder or direct to desktop for quick access to the file. Find the file and open it to begin editing the necessary text fields with your company information. You can start by entering the names of the employees in your department. The template is color coded for days like vacation, sick days, personal days and offers other custom colors to edit. Use the appropriate color code to make note of the reason for the employees’ absence. All changes you make will automatically update the details on the worksheet. The template can work just as well for companies with few employees too. Information is saved and can be useful when a manager and employee need to sit down and discuss any discrepancies in doubt. Since the template has additional color-coded keys that can be easy to customize, a manager can code it to acknowledge any other absence such as having to take a leave of absence due to a family emergency. Especially if the employees’ sick, personal and vacation days have been used. Using the 2014 employee attendance tracker is recommended for businesses that need to keep track of the attendance of their employees. It becomes a vital record for both the employee and management.